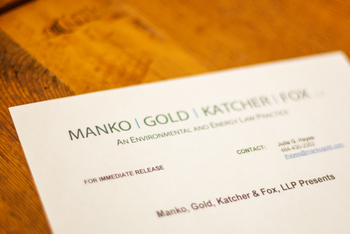 Philadelphia, PA (February 15, 2012) – Brenda Hustis Gotanda, a partner with Manko, Gold, Katcher & Fox, LLP (MGKF), the environmental, energy and land use law firm based in Bala Cynwyd, PA, will be a panelist on Thursday, March 29 as part of the Sustainability Symposium PA/NJ 2012 at the Franklin Institute in Philadelphia. The program brings together industry, university and community leaders to share best practice, ask challenging questions and provide cutting edge information about sustainability in the Delaware Valley. MGKF is also one of the sponsors of the event.